While there is some color in this collection, it's definitely more toned-down compared to Pop Art Craze. This bunch of shadows makes me think "fall". Each bundle is $2.99 (which is normally the price for just a trio-- you're getting the mascara as a bonus). So you're seeing trios in tones of purple, green, brown, and blue... however in a picture that was shared with me on Twitter, I noticed a packaged trio in grey/smokey shades (very similar to the regular line WnW trio in Don't Steal My Thunder). Not sure why that's not part of this display pic-- but I just wanted to give that a mention, just in case. The mascara that comes with each of the trios is the MegaProtein version. (The one pictured above is one I already had open and have been using on & off for a couple months). I am not at all a fan of this mascara. I don't really have a problem with the brush or the packaging... but this formula really does next to nothing for my lashes. I suppose it's a positive thing that it doesn't clump, but it just doesn't build much length or thickness. I'm not saying everyone's going to have that experience (this might be great for someone with naturally thick lashes who wants a natural look). Sadly, I haven't had good experiences with most of Wet n Wild's mascaras. I'm just glad it's being tacked on as a "bonus" with the combo packs and they didn't jack up the price. 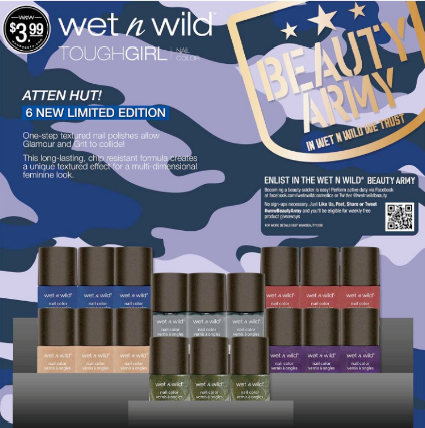 The shadows in the combo packs are pictured above (left to right): Enlisting for Beauty, Soldiers in Charms, Zero Dark Flirty, and I Don't Do Camouflage. This is more of a "show & tell" post on these trios, because I really haven't had much of a chance to try them yet and give a full review. I just wanted to get a blog out there so you could see what these look like- since we all know how limited edition collections don't always hang around in stores for very long. Judging by the swatches, overall these trios seem pretty consistent with the quality we've come to expect from Wet n Wild Color Icon eyeshadows. They're pigmented, smooth, and a little goes a long way (I didn't have to work hard to get the swatches to show up like they do, and I did not use a primer underneath). Enlisting for Beauty: Includes a matte cream, satin brown, and a slightly shimmery beige. I think this will be a popular pick among these trios because many of us love our neutrals! And nothing in this one is super metallic or frosty- making it very wearable for those who don't want to spotlight wrinkles in the eye area. Soldiers in Charms: This trio has a yellowish-lime shimmery green, a medium matte mossy green, and a super dark and sparkly olive green. That darkest color appears to be the same as the dark green in the Comfort Zone 8-pan palette. If you don't use the lime shade, you could get a typical olive green smokey eye, but I kind of like that they threw in the brighter shade for a little pop. 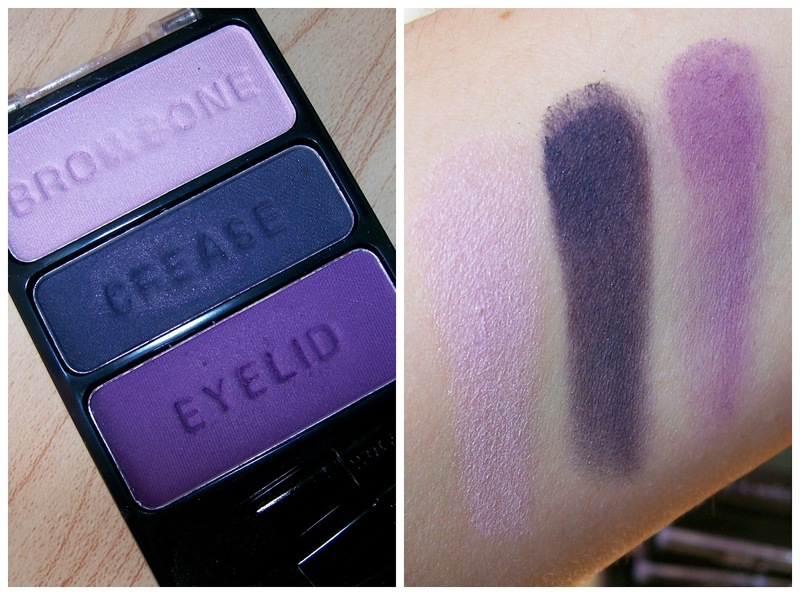 Zero Dark Flirty: Nice job, Wet n Wild shade naming department! lol. Here you're getting a slightly pearly soft lilac (warning- this shade is a bit flakey), a deep satin-finish plum (almost borders on navy), and a matte purple that's not quite as pigmented as I expected. It definitely could be built up a bit on the lids, and would no doubt perform better with a base-- but just a heads up that 2 out of the 3 shades in this trio are a bit weak. I Don't Do Camouflage: Here you have a slightly shimmery light blue, a deep sparkly navy, and an almost matte medium blue. The deep navy is almost like one of the navy shades in the Blue Had Me at Hello 8-pan palette, only this one seems a bit more dry to me (still pigmented though). Much like the other trios- you have a deep enough color to give you a smokey eye- but the option to kick it up with a brighter color. So I mentioned earlier that I saw a different kind of Tough Girl display at Walgreens (not sure what other drugstores might also be carrying it), but it had the trios for sale WITHOUT the mascaras. Also- there were a couple of additional shades-- the grey-toned trio that I mentioned (but I didn't purchase it since it seemed so similar to Don't Steal My Thunder), and also the one below which I (obviously) did pick up. Not sure why Wet n Wild didn't mention this alternate display in the info they sent to me. But just so you're aware... there are trios being sold on their own, and you may encounter shades you didn't see in the combo packs. Spoiled Army Brat: Here you're getting a shimmery mauve, a stain-finish rose, and a satin peach. For some reason the lighting on the swatches is making these shades seem much more warm than they are... they're coming off kind of coral, but I assure you that the mauve and rose shades come off much more pink. While I love the colors in this kit and I think it's really unique-- I was kind of un-impressed with the amount of color payoff in the swatches. I've always said-- you can't always judge by the swatches... I'm very curious to see how these do applied on the lids with a base. But I think they can definitely be worked with. I just wish there was a deeper shade in this trio- these rosy colors need something to create contrast and keep the eyes from looking sickly. I wanted to give you a look at the nail collection as well. 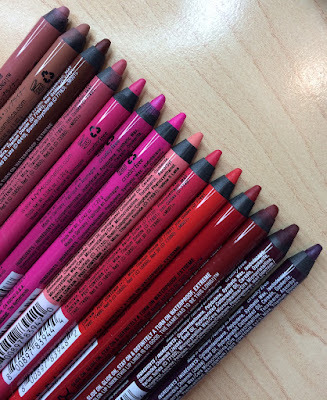 I haven't noticed this in stores yet, but most of the shades were sent to me, so I figured I'd show them. This is a TEXTURED nail collection. I know quite a few brands have put out textured polishes, but I haven't tried any of them, so I'm not sure what to think! I'll definitely try these out and report back. These retail for $3.99 each (more than a mascara & shadow trio combined! ), and my info says that these dry "in a glamour & grit finish". I have a hunch that I'm not going to like any sort of strange texture on my nails (I love shine!! ), but I will most definitely give it a whirl. Have you tried any textured polishes? What did you think? Left to right: Femme Trouper (cream with gold shimmer), Fatigue Glam (creamy rose), Tough Girl (creamy grey), Beauty is a Battlefield (shimmery purple), and Left, Left, Left, Right, Left (creamy royal blue). The display also appears to include an army green, but I didn't receive that one. 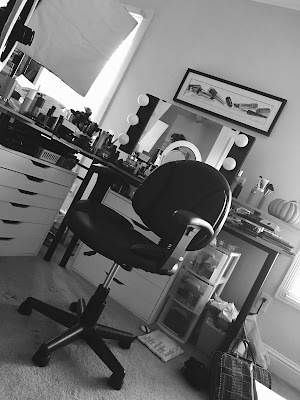 Here's link to today's edition of Beauty Broadcast LIVE- in case you missed it this morning! I gave a first look at some of the products I have from Michelle Phan's Em Cosmetics line... and of course there was much more randomness! I feel like this week has just flown by! Mini Hautelook Heads Up: Pixi is on sale (at the moment)- and the Soft Focus Fresh palette is available for a STEAL-- $9! That's a big palette! Originally $34. 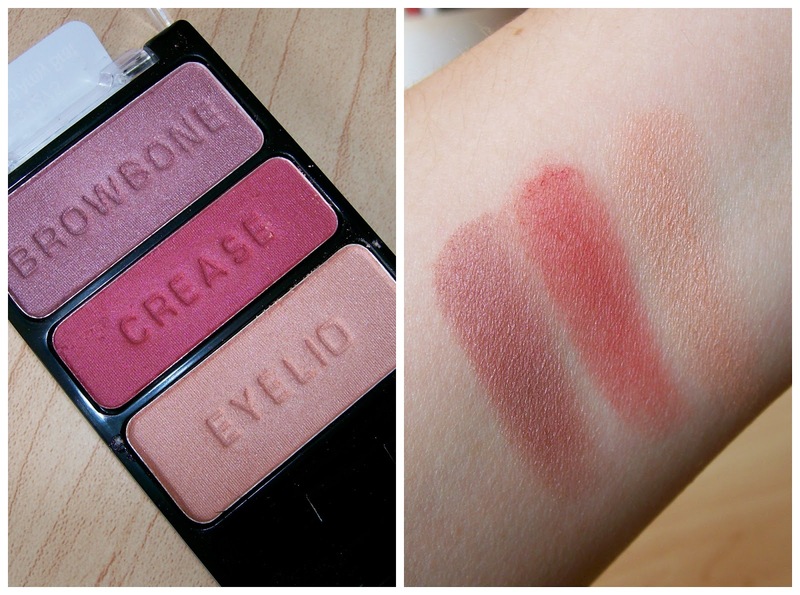 I blogged about it here if you want some more details/swatches/FOTD. It's a tilapia & salad night here at our house. Still loving my Gorton's Skillet Crisp! I swatched all of the polishes on my blog if you're interested! The green is my favorite! Is it strange that I read this post in your voice lol. I do too LOL !!! Really like the neutral palette in this collection and a little disappointed by the purples as well. Thanks for posting the Spoiled Army Brat palette, I really like that one. Great post Emily! I can NEVER find the limited edition Wet n Wild products anywhere. I live in the Bay Area of California. Can someone please direct me to a store that would have them? I've tried Riteaid, CVS, and Walgreens. I live in cali too & ran across them today. Have you found them yet? I have the Soldiers in Charms, but it is different than your's. 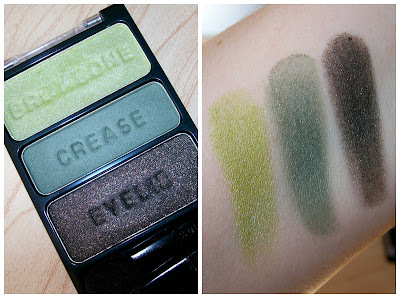 On mine the darkest color is in the crease and the medium color green is on the eyelid. Three of these palettes seem like mini versions of their 8 pans, the green being comfort zone, the blue being blue had me at hello, and the purple being petal pusher. I think I am going to have to get enlisting for beauty but I'm going to pass on the others because I have the corresponding 8 pans. I am really impressed with comfort zone, walking on eggshells, and silent treatment, but some of the other color icon palettes have just been misses for me. 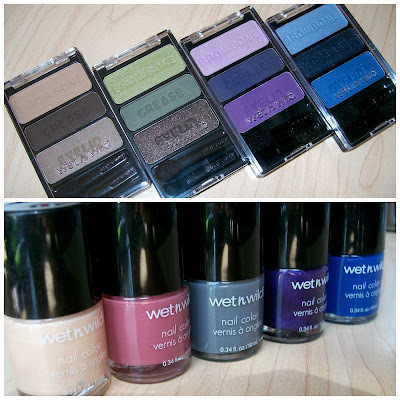 They seem dry and have poor color pay off, which is not what I have come to expect from wet n wild. Color Icon seems to be either huge hit or major miss for me unfortunately. I love wet n wild. I have two palettes and they are the best! I so wish we got more Wet n' Wild stuff in Canada! We have the basics, but nothing like this! I got the neutral palette - and I think it will be fine to mix with other palettes - a lot of the shades come off pretty matte. But to be honest it was nothing special. And as Sophia mentioned, if you have Comfort Zone, Petal Pusher and Blue had me at Hello you don't need these. I also felt like mine wasn't as buttery and smooth as my other WNW trios. I haven't seen the trios with the mascaras in Utah. The trios with mascaras are ones from their regular line. I like the Spoiled Army Brat the best. The colors from SAB don't seem to be repeats from any of their other palettes. 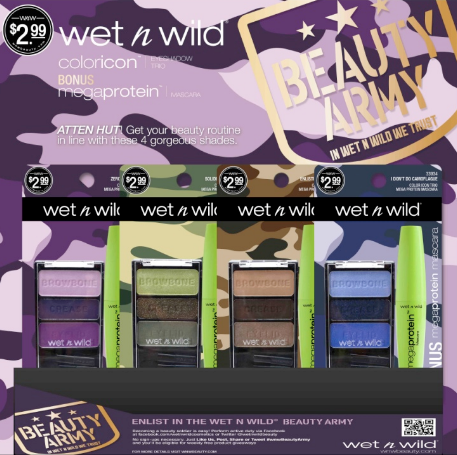 Wet n' Wild needs to get to the UK! Thanks for the tip on the Pixi palette! I want the neutral one!! The last palette would look great used as... blushes. Am I the only one thinking that? I have the neutral, coral, and green palettes and love them. One thing I just noticed is that your green palette has the crease and the eyelid color reversed compared to mine (and all the ones I've seen online). Odd, but still works! Great post!! I MUST MUST MUST find that neutral and pink trio palettes, those are amazing!!! I just purchased my first ever WnW trio (Walking on Eggshells) and have been wearing it everyday. These newer ones are soo amazing! Really hoping I can find them around my Walgreens! Thank-you for the update on new products!!! As far as textured nail polish goes, I have only tried the OPI liquid sand collection and although there were some gorgeous colors, I could not get passed the gritty feeling so I had to pass on that trend. Interested to see what you think though! Thank you for the swatches , Emily ! Looks like I need to pick up Spoiled Army Brat . Wow those are absolutely beautiful.Especially the purple shades. Thanks for the review. Thanks so much for this! I originally thought I was interested in a few of these after seeing pictures. Now that I see them swatched, I can probably pass. Great post! I have a few OPI liquid sand polishes that are gritty. However, I just put a topcoat on if I want to make the finish shiny and it works great! I can't find those eyeshadow trios at any of my drugstores and I want them so bad! This is random and unrelated lol but if you go on walmart's website and in the makeup department search mac they ACTUALLY HAVE like 15 products! I think that's crazy! I have the "Gumdrop" collection of textured polishes from Julie G., and I love them! I especially like just doing the tips or one or two accent nails. thanks for the round-up! I agree that the spoiled army brat needs a deeper shade. Do you think something from the petal pusher palette would work? Ooh I love the blue palette! I seen the nail polish display yesterday in my local walgreens. WNW products sell out too fast. I wish the company will improve on that. I picked up the silver, black and white one you're talking about, and it it's more of a gunmetal gray/silver in the LE palette than what's in the permanent collection, and I love the black in this one, matte, matte, matte. It also applies well and smooth. The only one I didn't pick up was the pink one. Had it ran more coral, I would have. Pink shadow always makes my eyes looked washed out so I passed. Just to let u know I have been eating those skillet crisps non stop since I saw it in one if your videos! They are delicious! The only textured polish I've tried is OPI Liquid Sand collection. It is definitely not shiny after it dries. I love it for doing a colored French tip though, well not me but I take a bottle to my nail guy. lol The contrast between the textured polish and a super shiny shade on the same nail makes them really pop. May not be awesome alone though. 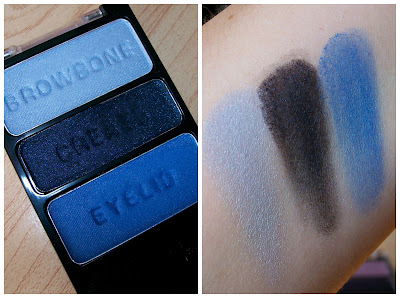 Swatches look awesome, my eyes are pealed! The textured nail polish looks awesome as a ring finger accent nail! Okay, I finally seen the display for the e/s. They were all sold out of the brown and green palettes. :( The blue looks beautiful on the blog, but a bit shimmery in person. Thanks for always sharing. Walgreens has your walking on eggshells palette for $2! I hate that I can never find these limited WnW things. My local Walgreens seems to be about the only place to find this brand and it is hit or miss if they have limited edition stuff. You'd think living in the Twin Cities of Minnesota these things would be much easier to find!! I am so bummed! I looked all over for these and never found a display that wasn't empty. Everyone seemed to run out the week they came out. On that note, if anyone picked up extras of "Enlisting for Beauty", "Support Our Troops", "Soldier in Charms", or "I Don't Do Camouflage"...I have some other WnW limited edition trios and/or Maybelline Color Tattoos to trade. Drop me a line at paradigmrouge on gmail. 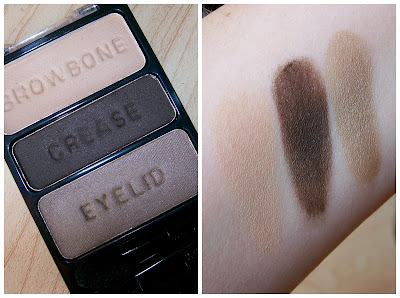 the browbone shade in Enlisting for Beauty is my all time favorite crease color. I have searched high and low for a dupe, and nothing is quite right. Suggestions?? ?